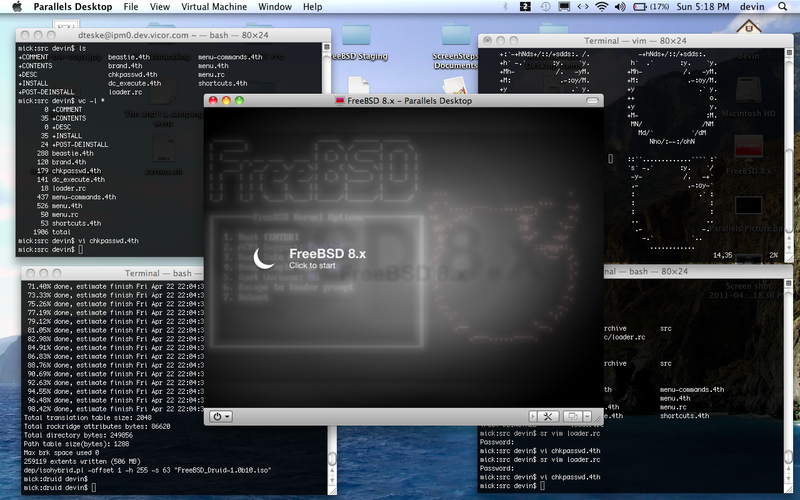 FreeBSD. It is Free (in the truest sense; with a capital-F) and is a descendant of Berkeley Systems Distribution (specifically BSD-Lite v4.2/4.4), which originated from the University of Berkeley, about 2.5 miles away from where I live (though I’m not a student, nor have I ever been). FreeBSD is an amazingly versatile and flexible UNIX operating system with ancestry reaching back decades. This entry is for those persons already well versed in this well-edified system. I would like to announce a completely new — written from scratch — boot menu for the FreeBSD operating system. It is today that I release the code that I’ve been developing for nearly 5 years. Code to enhance the level of options provided to the user at each and every boot of this venerable OS. Historically, the original menu offered by FreeBSD featured our beloved helper-daemon mascot, named “Beastie.” But soon after, this menu was revamped to [a] lay-rest our triton-carrying/sneaker-wearing assistant in favor of the less-controversial textual “FreeBSD” banner and [b] imbue the menu with new options. However, one of the things that is not currently possible is the ability to boot into any combination of the aforementioned options. That is to explain, you cannot boot into single-user mode with ACPI disabled but verbosity enabled. The reason for this is obvious as once a menu option has been selected, the system proceeds to boot with those options rather than allowing additional selections to be made. See below. Enter my new menu (pictured below in the following paragraphs), first created in 2006 internally for a proprietary custom installer, now generalized for the rest of the world and being released for all to enjoy. This new loader does not proceed to boot the system after selecting a menu option but rather updates the menu to display the option status, allowing the user to toggle any number of multiple options before pressing ENTER to finally boot with the displayed options. When the contest ended, I had my fun in running the graphics through some Image-to-ASCII conversion programs without much luck. Months later, I doubled-down my efforts still to no avail, attempting to create an ASCII-art version of the new orb to display at boot time. Six months later, I succeeded in producing a bi-color ASCII-art representation of the “horny orb” logo easily recognizable as the FreeBSD logo. This gem (as well as a B&W copy) have been added to the latest “beastie.4th” module for your viewing pleasure and is enabled by default upon installation. Installing the new boot loader menu couldn’t be easier. After downloading the FreeBSD package from http://druidbsd.sf.net/, use the pkg_add(1) command to install the package, and finally reboot. Other additions that you will notice are that the replacement menu does not load right away. Another enhancement is that there is a 2 second delay before launching the menu where the user can press Ctrl-C to escape the menu, allowing immediate booting or escape to the loader prompt. Something that the current menu does not allow for. See below. The new menu is a system of ANS/FICL Forth (a reverse-polish stack-based language) modules that extend (but do not replace) the standard FreeBSD boot loader (/boot/loader). An interesting note about this package is that it will backup any files that will be replaced during installation to the file /var/backups/loader_menu.backup.tgz. Should you decide that you do not like the new and improved boot loader, you can uninstall it, returning your system back to the original boot loader by using the pkg_delete(1) utility (the backup will automatically be restored upon pkg_delete(1)). 1. The menu that we are replacing only conditionally displays the option to disable ACPI support (based on whether you are running an i386 compatible system), whereas the new loader always presents this option. This should be of no concern unless you’re running a non-i386/amd64 system (such as sparc, pc98, ppc, etc.). 2. The ability to boot into single-user mode by pressing “s” and boot verbose by pressing “v”, etc. is not enabed. The proponents for these options on the FreeBSD-Questions mailing list were clear in that they liked these options because they allowed “one-key” booting into a special mode. However — with the new menu — even if I enabled the use of those keys as shortcuts for toggling these options in the new stateful menu, the user would still have to press an additional key to boot (‘1’ or ENTER). So the primary principle use — one-key booting into a special mode — is no longer capable, unless I add these keys not as togglers for the visible menu items but invisible hot-keys for immediately booting into single/verbose mode. I’ll have to sleep on that (maybe as a concession for power-users as invisible options are obviously less than intuitive). However, don’t let those misgivings dissuade you. All but the most ardent and stringent of surveyors will find those to be shortcomings and overall I predict your experience will be a rather pleasing one. Overall, the new stateful nature of this menu over the old makes it far less likely that a user will need to reboot if they hit the wrong key. The only mistake that could result in wasted cycles would be if they prematurely hit #1 to boot or hit #7 to reboot. All other options would simply toggle a menu item (except for #6 to escape to the loader prompt, to which they can immediately return to the menu if desired). Last, but certainly not least, I’m including a completely rewritten password-checking module to replace the existing one (I couldn’t get the standard one to work). See below. I hope that you like what I’ve developed, and your feedback is certainly welcome. I’ll be cross-posting this to the FreeBSD mailing lists, announcing in RSS feeds, and updating http://druidbsd.sourceforge.net/ all simultaneously to coincide with this blog-post.